Jack is a big proponent of touch therapy and hugging. He believes that touch is beneficial for many conditions and in ways we don't fully understand yet. It is not our practice to endorse products unless it's something from which Jack himself has obtained benefit, and we are not endorsing this one. We simply found the concept intriguing, and decided to showcase it as an example of one of many therapeutic devices available outside the mainstream medical establishment. As always, exercise due diligence and perform your own research before purchasing anything you find on the Internet. This ingenious system is used for deep touch stimulation and produces a calming effect on hyperactive and autistic individuals. The Squeeze Machine consists of two padded side boards which are hinged at the bottom to form a Vshape. The user steps into the machine and lies down on the inside of the V-shaped crevice-like space. The inside surfaces of the device are completely lined with thick foam rubber. Deep touch pressure stimulation is applied along both sides of the person’s body, with lateral pressure pushing inward onto the body. The V-shaped space supports the body fully from head to toe, so that the users can completely relax. The contoured padding provides an even pressure across the entire lateral aspect of the body without generating specific pressure points. The foam-padded headrest and padded neck opening are covered with soft fake fur. The user has complete control over the amount of pressure applied. A lever-operated pneumatic valve, which is connected to an air cylinder that pulls the side boards together, allows the user to self-regulate the amount of pressure applied. 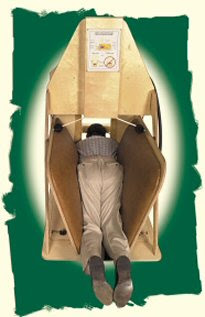 The advantage of the Squeeze Machine over other forms of deep pressure stimulation, such as rolling in blankets or mats, is that the machine can apply greater amounts of pressure over larger areas of the body, much greater pressure than a blanket, yet still be comforting and soothing to an individual. control of the amount of touchpressure he or she receives is of the foremost importance. Since the Squeeze Machine is designed to feel very much like being held by another person, the device might help the user to accept, and perhaps enjoy, being held or touched by another person. Learn more about The Squeeze Machine here. DISCLAIMER: WE HAVE NOT USED NOR EVEN SEEN A SQUEEZE MACHINE AND IN NO WAY SHOULD THIS POST BE INTERPRETED AS AN ENDORSEMENT OF IT. USE YOUR OWN JUDGMENT IN EVALUATING IT, SEPARATE AND APART FROM ANYTHING READ HERE.